In a world where we invest thousands of dollars in entertainment, clothing, and vacations, the right thing to do would be to invest in our health as well. But health means so much more than just your annual visit to the doctor: it means investing in items that ensure our comfort and help us cut the root of all evil. You probably won’t understand how important it is to sleep on a good mattress unless you’ve slept badly because of one in the past. 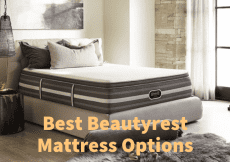 If you’ve ever owned an old coil mattress that you’ve basically used to saturation, you know the discomfort and next-day pain that a bad bed can cause. With that in mind, don’t be afraid to invest in a comfortable mattress. Speaking of comfortable mattresses, we have two treats in store for you today. We have an all-natural, all-green, all-eco, all-super environmentally friendly mattress that’s known as the Avocado Green. Straight from the cover, the Avocado Green uses only natural and organic materials that go straight to its very core, which integrates coils made from recycled steel. The other mattress has spent so much time researching people’s sleeping habits, that it found a way to develop a technology that identifies where your body needs extra support and provides it. You’ve guessed it, I’m talking about the Purple mattress. Both of them super-cool and supportive, yet they are completely different products. The combination between Joma Wool® that’s sourced from New Zealand and the organic cotton makes the cover of the Avocado Green mattress both soft and breathable. When wool is used in manufacturing the cover of a mattress, it’s typically because of the moisture wicking properties of the fabric. Aside from that, it also helps regulate temperature and is used for its antimicrobial properties. 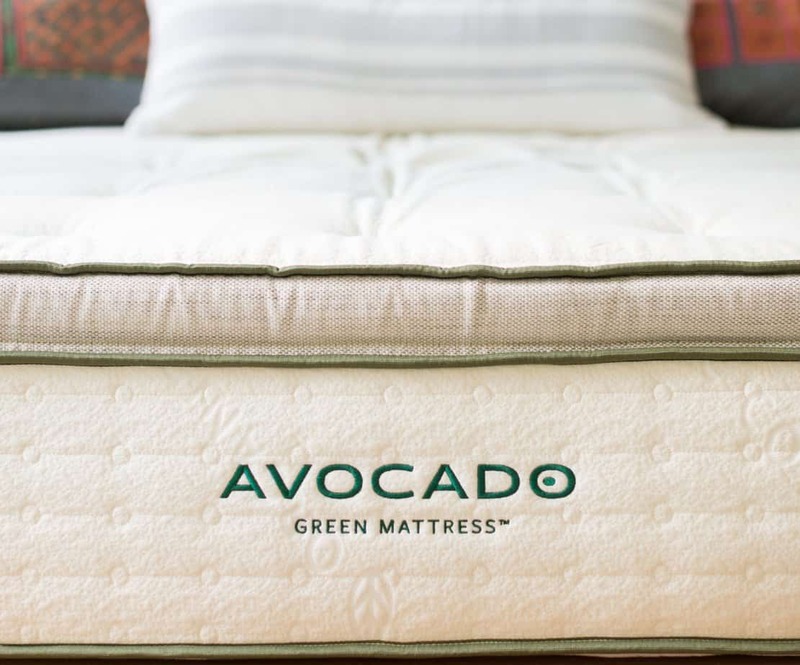 The Avocado Green also features an interesting technique that adds durability to the mattress. There is button-tufting wool yarn used to create rosettes that go from the top to the bottom of the mattress. In other words, the layers of the bed are sewn together, strengthening the structure of the mattress. Let’s move on and talk about the comfort layer of the Avocado Green mattress, which is made from 100% Dunlop latex, a material that we always feel is underrated. Latex is a really good choice in a mattress, first of all because it runs cool and second because it gives the mattress a little bit of bounce (or a lot, depending on how thick the latex layer is). This particular layer measures two inches in thickness, but there is also the option of purchasing a pillow top that will add more latex to the mattress (see the “Unique Features” section below for more info). Because this layer has a quick response, it makes it easy for the sleeper to switch positions and get in and out of bed with minimal motion transfer, so that the partner’s sleep is not disrupted. The core of the mattress is given by the eight inches of individually pocketed coils, that bring a whole bunch of benefits to this product. The Queen size of the Avocado Green mattress has no less than 1,130 support coils and this number varies depending on the size chosen. Since this is a mattress aimed at delivering a natural and organic product into your home, the coils are made from recycled steel, but without compromising the quality of the support system. The benefits of pocketed coils in a mattress are numerous: from the generous space that maximizes airflow to the motion absorbing properties and superior spinal support. 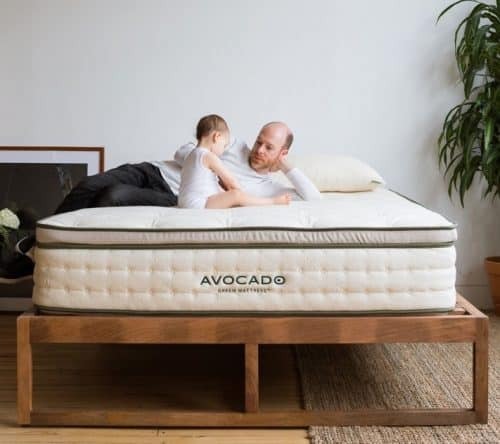 Even if the thick layer of support coils is solid enough to act as the base of the mattress, Avocado has thrown in an additional protective base layer. This layer measures one inch in thickness and is a made with Dunlop latex, but this time, in a much higher density. Since this layer is very firm, it can support the entire weight of the mattress and its sleepers, protecting the coils above and transitioning between them and the foundation of your bed. The firmness of the Avocado Green mattress will depend on whether you opt for the additional pillow top or decide to go with the standard model. With the pillow top and the added comfort from the extra two inches of latex, the mattress’ firmness rating is about a 6.5. If you leave out the pillow top, the mattress will be firmer, since the comfort layer is also thinner. That leaves us with a mattress that’s rated with a 7 out of 10, falling closer to the upper firmness limit of a bed. When pushing down the surface of the mattress, you will immediately start to feel the bouncy response of the latex layer. 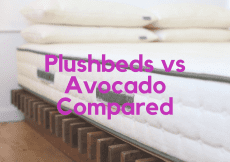 However, what’s really important in determining the feel of a mattress when sleeping in different positions, to better assess the target audience for the Avocado Green Mattress. Lying on your back, you will immediately feel the combination of comfort provided by the latex layer, as well as the support that comes for the coils. Due to its construction, the Avocado Green can provide superior lumbar support and maintain your spine in proper alignment. For those of you who prefer to sleep on the side, the pillow top is a definite plus. That’s because the added layer of latex can provide additional pressure relief in your shoulder and hips area. Without the pillow top, the Avocado Green mattress has a firmer fill that’s noticeable in this position, which means that in time, you may wake up with sore hips and shoulders. For stomach sleepers, the version without the pillow top is way better. The firmer mattress will push your hips upwards, to prevent an unnatural curving of the spine. 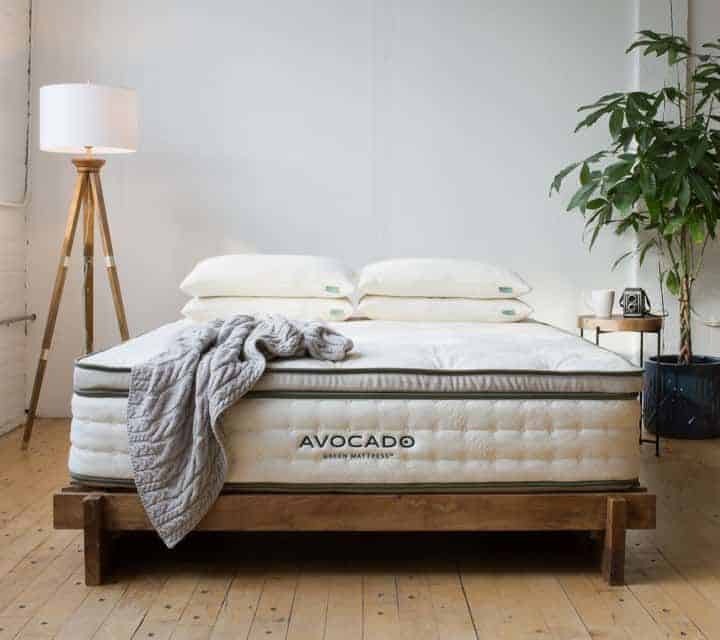 One of the things that make the Avocado Green mattress stand out of the crowd is the three-zone division of firmness catered to different areas of your body. You may not know that the shoulders, lumbar and pelvic area are typically the areas which are the hardest to accommodate. Avocado understands that and provides tailor support for these three areas in particular. For instance, your pelvic area carries the most weight, while your lumbar region is thinner. Because of these individual traits, a mattress with more customized support will often be preferred in the detriment of one that has the same level of support across its entire surface. If you purchase the additional pillow top, your Avocado Green mattress will have a slightly different construction, in a sense that you will have an additional layer. Obviously, this added layer is found right at the top of the mattress and consists of another two inches of Dunlop latex. 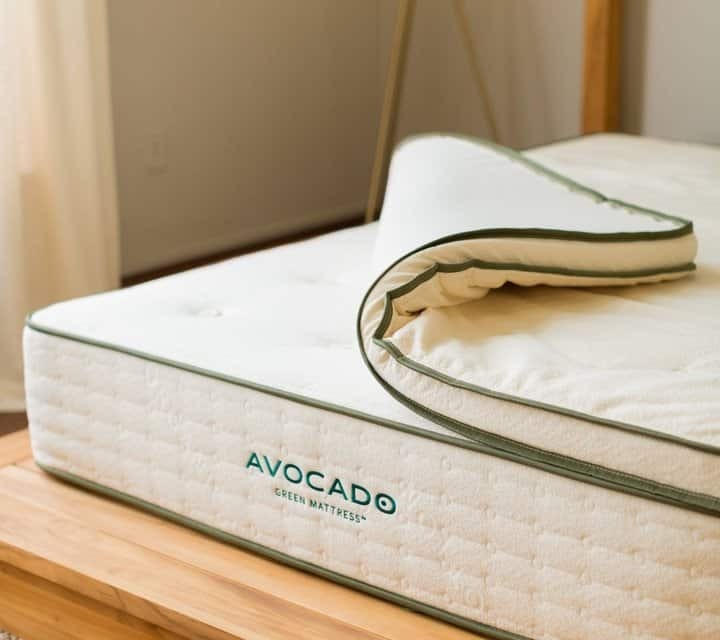 Because of the bounciness and elasticity of the material, this will add more pressure point relief and brings the Avocado Green mattress to a total of 13 inches in thickness. The combination used to create the top cover of the Purple mattress is a very interesting one. We have the elasticity of viscose, which makes the cover smooth and soft to the touch. We have the polyester and the lycra fabrics that work together to wick moisture and create a breathable cover, thus helping you avoid sleepless nights that are due to extreme body temperatures. This comfort layer is the very core and main selling point of the Purple mattress. It’s unlike anything else you’ve witnessed so far in terms of mattress comfort zones. Instead of being just one big block of material, this layer has a grid structure, made from polymer. Aside from creating bounce, this structure was designed in a way as to trigger superior support for areas where your body parts press hard against the mattress. How does it work? Basically, the layer provides support until a certain threshold is reached. Then the mattress identifies extra pressure in certain points and allows that area to sink in further while supporting it even more. Because of its construction, this layer will distribute the weight of your body across the entire surface, molding to your body and your pressure points. Because every good mattress has a transition layer between the comfort and the base zones, the Purple isn’t an exception to this rule. Underneath the polymer columns, we find a layer that’s made with polyfoam and provides compression support for the Purple. A solid base layer is always needed. It gives the mattress its shape, as well as provides durability and stability to the entire structure. 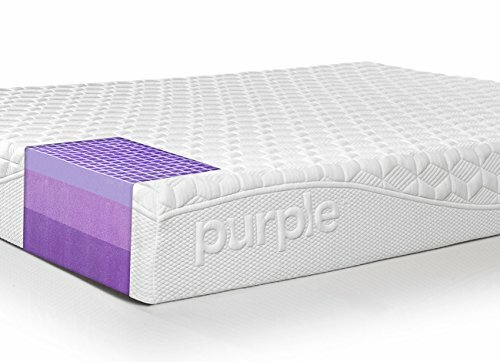 At the bottom of the Purple mattress, there’s a solid four-inch block of high-density polyfoam, which supports the entire weight of the mattress and add durability to the layers above it. 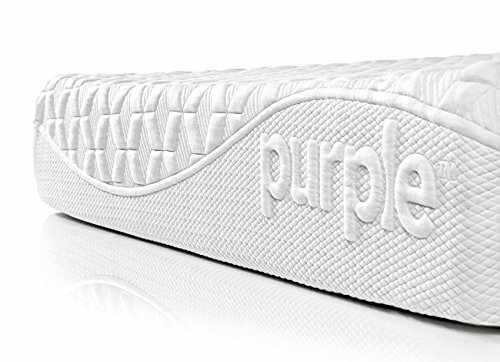 The Purple mattressadvertises itself as being a bed that gives that “just right” feeling, because of the polymer layer that triggers additional support where it’s needed. 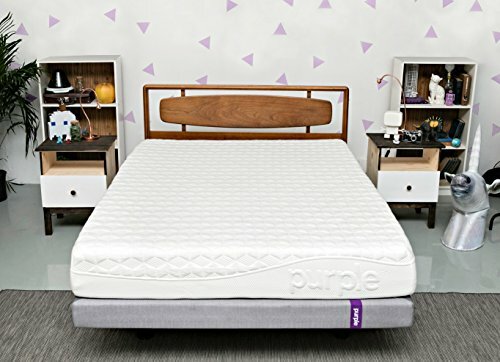 Several tests performed have revealed that the Purple mattress has a firmness rating of about 6 – 6.5, which is pretty much the industry standard for a medium firm mattress. But before we move on to explaining how the mattress feels under different sleeping positions, there’s more thing left to add about this highly-advertised comfort layer. The polymer columns only collapse under a specific pressure, which means that people who are lightweight won’t be able to enjoy the benefits to the max. Each sleeping position will trigger different pressure points that allow the body to sink into the bed as needed, or oppose resistance and cause muscle and joint pains. Since there is a lot of hype surrounding the superior support that this mattress can provide, we had to test it and see for ourselves if this could be, indeed, the mattress that revolutionizes sleep by supporting every sleeping position. When lying on your back on the Purple mattress, you can sense the comfort provided by the polymer columns. The spine is kept in shape and there are virtually no pressure points that could cause any pain in the long run. It’s safe to say that the Purple mattress offers excellent support for back sleepers. Rolling over to the side, you’ll notice how easy it is to transition between different sleeping positions because the comfort layer has a quick response to pressure. Instead of feeling like you’re moving around in quicksand, the mattress’ bounciness will feel like a helping hand when moving from one side to another. Side sleepers will be happy to know that the Purple offers do a great job in minimizing pressure points and providing support for this sleeping position. In our experience, side sleepers often have the hardest time in finding a mattress that’s good for them, because the hips and the shoulder will sink into the surface of the mattress so deep, it takes a very soft comfort layer to soothe them. If you like sleeping on your stomach (although not recommended), you will again feel how the mattress distributes your weight on the entire surface, triggering the polymer columns to provide additional support. Because of this technology, your hips will be pushed back upwards, preventing them from sinking into the mattress too deep. That being said, we’re happy to report that whatever your favorite sleeping position is, the Purple mattress can give you the much-needed support. We wanted to talk about the edge support of the Purple mattress because we have high expectations because of the comfort layer that triggers under pressure. Since its main role is to distribute the weight evenly, we expect it to perform no matter where you sleep on the mattress. Thankfully, we’ve discovered that sleeping closer to the edge of the mattress is pretty similar to sleeping closer to the center. There is little compression felt even as you approach the edge, but nothing that comes even close to the falling-off-the-bed feel. This is yet another chapter where the Purple mattress doesn’t fail to deliver. 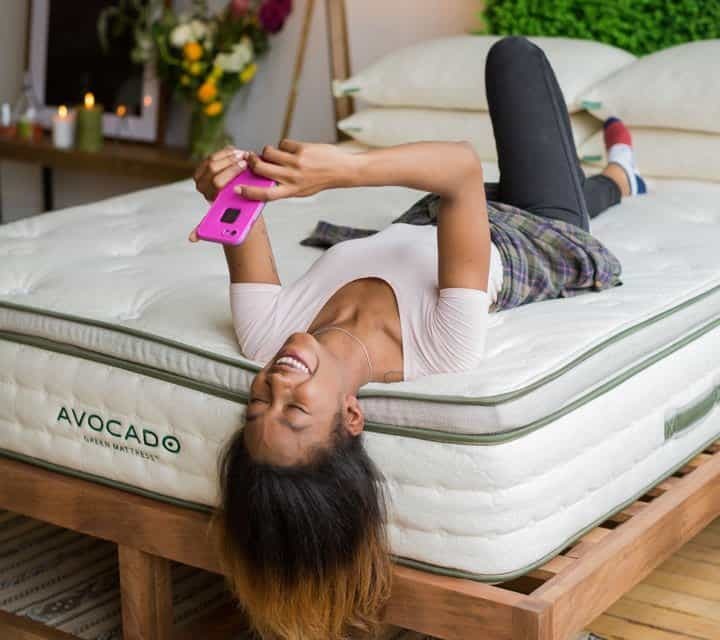 It’s clear that Avocado was determined to deliver a high-quality green mattress that’s made with the finest materials and developing while having the best interest of the consumer in mind. They say that the devil is in the details, and there are a lot of details that makes us appreciate the Avocado Green. First, there is a high-quality cover, made from an organic combination between cotton and New Zealand wool. The wool yarn rosettes that traverse the entire height of the mattress keep all the layers together, to create a more durable product. Then there’s the optional pillow top, that basically allows you to add more softness to your mattress, which will surely come in handy if you like sleeping on the side. Moving past all the certification, the free shipping, generous trial, and warranty conditions, we absolutely must remind all of you about the three-zoned support that proves once again, the Avocado Green is all about the sleeper’s comfort. The Purple mattress is a definite game changer. We like to think of it as a smart mattress (not to be confused with a smart bed), which is capable of identifying where your body needs more support and pressure point relief and offer it. It’s basically a mattress that understands your favorite sleeping position and works towards providing you with the best relief. This brings us to the obvious conclusion that the mattress is suited for people that prefer each of the three main positions. Due to the grid-like structure that creates gaps between the polymer columns, the Purple mattress is a great heat dissipator. It could very much come in handy if thermal discomfort is something you often experience. Also, there is a very pleasant bouncy feeling to the mattress, minimizing motion transfer and creating a product that’s great for couples. 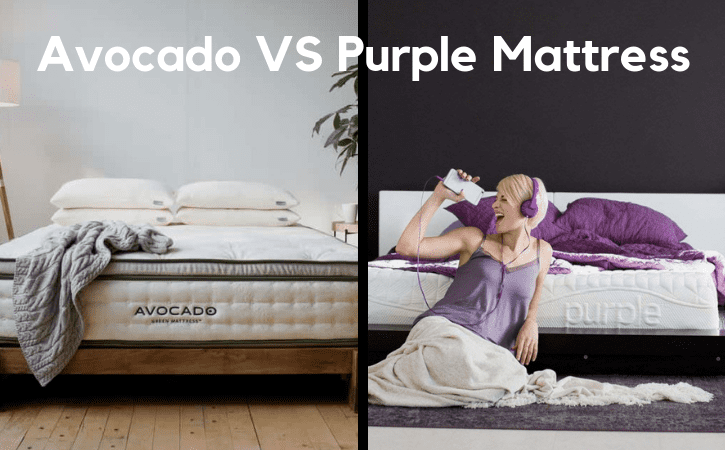 While they’re both comfortable mattresses, the Purple and the Avocado Green don’t exactly address the same target market. One of them is suited for people who want an eco-friendly product that’s invested in durability and comfort, while the other one has innovated the design of the comfort layer to cater to all sleeping needs and especially please people who tend to sleep hot. With mattresses, we do believe that it’s mostly a matter of understanding your particular sleeping habits and then experimenting with different kinds of mattresses and discovering which of them suits you best.